Fortunately he was not one of the 12,000 Allied prisoners who perished as a result of extreme maltreatment, starvation or disease, but his health, both physical and psychological, was seriously affected. After liberation, whilst in hospital in Ceylon, Fred was nursed by Joan whom he married. Advised by the doctors to face his horrific experiences, he and Joan spent the winter of 1946 – 1947 getting his story down on paper. Seventy years on, sadly after his death, Faith, Hope and Rice, (which were what sustained Fred through his ordeal) can now be shared with a wider audience. Readers cannot fail to be moved by the author's and his comrades' inspiring courage and resilience in the face of extreme adversity and ever present death. 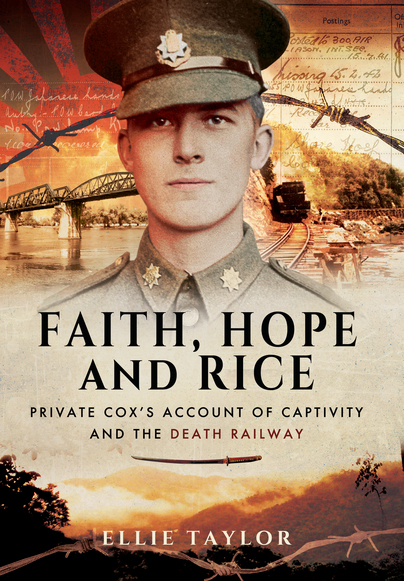 My father, Hugh Frederick Cox was captured at the fall of Singapore and, like thousands of others, spent the next three and a half years as a prisoner of war of the Japanese, mainly on the infamous Railway in Thailand. I joined COFEPOW around three years ago in order to try to find out more about his experiences. After he was repatriated in 1945 he wrote about what he had been through, and many years later, shortly before he died, had decided to try to have his story published. Sadly this did not happen, but I decided to try to finish what he started. Attending a COFEPOW service for the anniversary of VJ Day in 2012 and talking to a few members was the kick-start I needed. Keith Andrews then very kindly found my dad's documents at the National Archives and it was a starting point to researching dates, place names etc that my dad had noted down, so that I could make sure that in restructuring his account of events where necessary in order to make it more readable, I got things right. I'm very grateful for the help and encouragement I was given, and am pleased to say that 'Faith, Hope & Rice' by Ellie Taylor, was published on 12th October (2015) by Pen & Sword Books.